A while ago, Triston of The Girlie Blog has contacted me (and some of my favorite petite bloggers) for an interview with Northwest Asian Weekly. 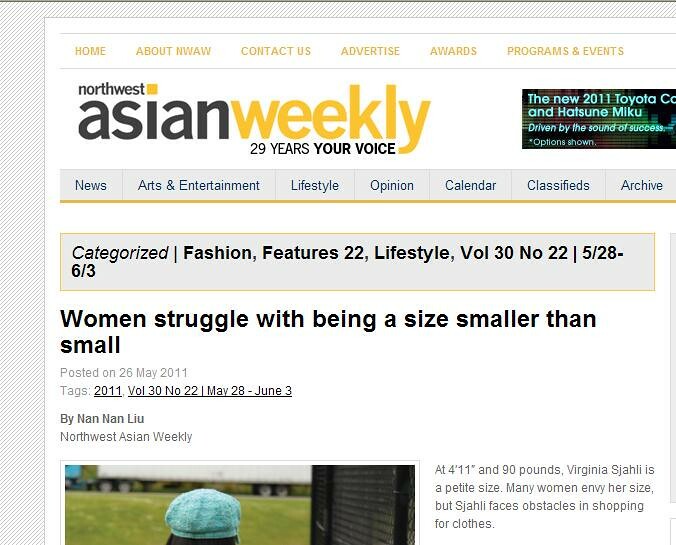 The interview was about how petite Asian bloggers help other petite women with their fashion problems. The article is finally published. Click here to read the full article. A huge thank to Trishton and Northwest Asian Weekly for giving me a chance to share my experiences. I read the whole article! It's so cool... and I was really interested! I found out about your blog because of NW Asian Weekly. Congratulations on the feature! @Christie Thanks for stopping by Christie! @Stacey I am glag you enjoyed the article. I enjoyed the interview as wel. What a great article! I wish they included some pics from you and Elle though :) Congratulations on being featured - that's so awesome! Congratulations Sydney, what an honor!